On December 8, 2011, Judge Joseph Van Jura of the Luzerne County Court of Common Pleas issued a detailed 39 paged Opinion outlining his decision in favor of the Citizen's Voice in re-trial of a local businessman's defamation lawsuit. The case of Joseph v. The Scranton Times, et al., No. 3816 - C of 2002 (C.P. Luz. Co. Dec. 8, 2011 Van Jura, J.) was the same matter that the newspaper previously alleged was fixed during the first trial by now-jailed county judge Mark A. Ciavarella. The first trial had resulted in a $3.5 million dollar verdict in favor of the Plaintiff before being overturned on appeal. 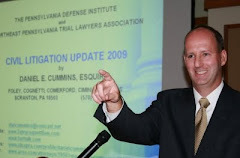 Anyone desiring a copy of Judge Van Jura's Opinion, which contains a detailed analysis of the current status of defamation law and the available damages under such a claim in Pennsylvania, may contact me at dancummins@comcast.net.